With Halloween just around the corner, we thought hey let's have some eerie fun with our second nail art tutorial instalment with Posh! Nail Spa! 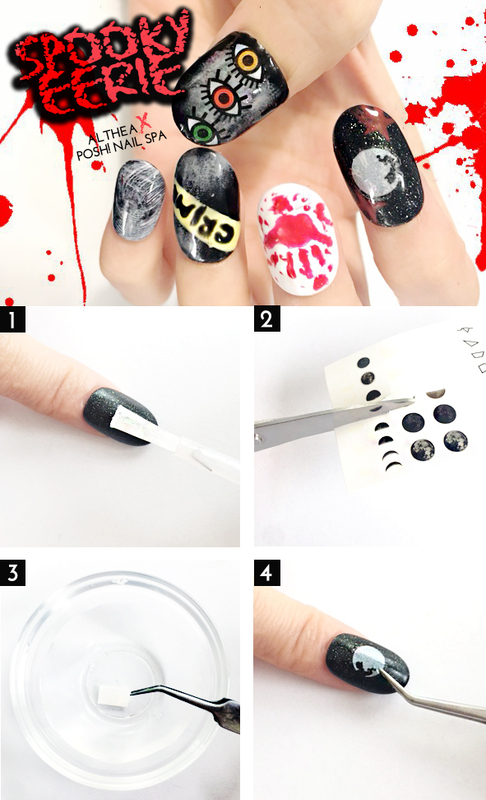 Nail designer Cha Yee obviously have a lot of fun creating her version of gory blood chilling Halloween nail art using the Nail.Me Water Decal. She used design no.3 and no.4 for this look with an added touch of yes, bloody hand prints and a crime scene investigation nail art on it. We say, you did a spooktacular job with this one Cha Yee! Here's how you can make your own D.I.Y Nail Art Tutorials using the Nail.Me Water Decal from Althea. Make sure your nail is free from any oil or dirt, then apply a layer of base coat. Follow up with 2 layers of base polish of your choice, and allow to dry between layers. Cut out the design you'd like to use and dip it into some water for about 10 seconds. With a gentle touch, slide the decal off the paper backing and carefully apply it to the spot of your choice with a pair of tweezers. Gently press it down onto the nail and let air dry or dry off lightly with a paper towel. 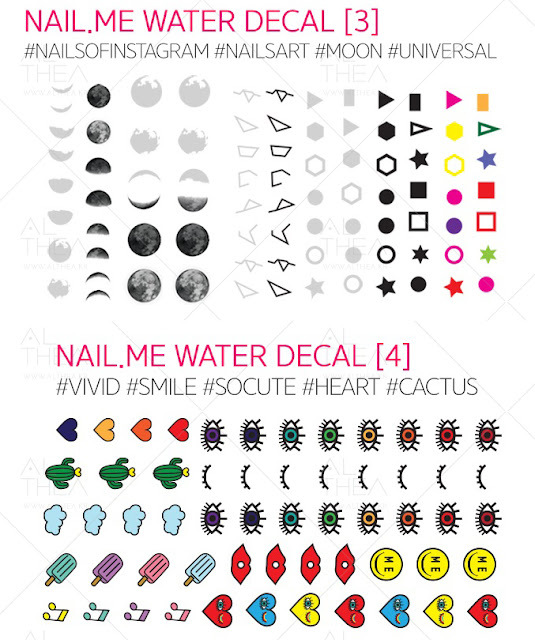 You can choose to stop here, or add more stickers and accessories to your nail look. In the example above, we've added some striping tape to the ends to give it an extra special touch. Once you are happy with the design you've created, apply a top coat to smooth out and seal in your artwork, keeping it lasting as long as it can. Allow to dry, and you are done! How simple was that? We love how these nails turned out, and it's definitely perked up our week! These decals come in a variety of different designs too, so make sure you check them out here. Would you try these out? We'd love to see your creations with your favorite decals, so make sure you tag #AltheaKorea on Instagram to show us! all of them are soooo cuteeee.